What Day Of The Week Is November 26? 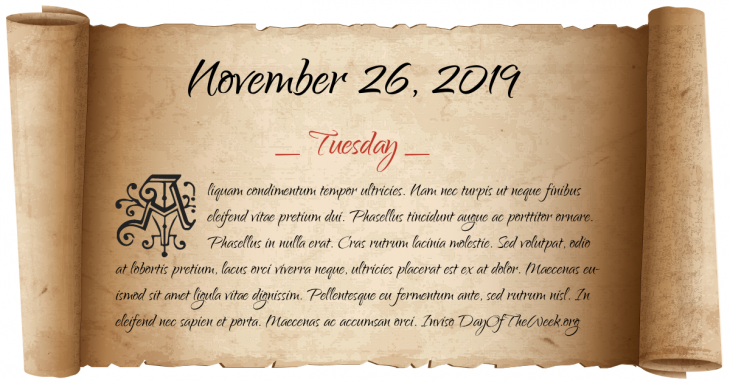 November 26, 2019 is the 330th day of the year 2019 in the Gregorian calendar. There are 35 days remaining until the end of the year. The day of the week is Tuesday. A national Thanksgiving Day is observed in the United States as recommended by President George Washington and approved by Congress. Sigma Alpha Mu is founded in the City College of New York by 8 Jewish young men. Shelling of Mainila: The Soviet Army orchestrates the incident which is used to justify the start of the Winter War with Finland four days later. World War II: HMT Rohna sunk by the Luftwaffe in an air attack in the Mediterranean north of Béjaïa, Algeria. Iran-Contra scandal: U.S. President Ronald Reagan announces the members of what will become known as the Tower Commission. Male Po'ouli (Black-faced honeycreeper) dies of Avian malaria in the Maui Bird Conservation Center in Olinda, Hawaii before it could breed, making the species in all probability extinct. Ruzhou School massacre: a man stabs and kills eight people and seriously wounds another four in a school dormitory in Ruzhou, China. Who were born on November 26?